Having a closet can be a blessing as well as a catch 22. They are so easy to store items however, they're also easy to clutter, due to the fact they don't get as much use as other parts of one's home. If a closet becomes too disorganized, it becomes harder to find items, and in today's busy household it just isn't a productive way to make use of your time. If you are cleaning your closet, you can also sit down and organize it your way, coming up with what is called a custom closet space instead of looking at the same boring old closet. How are you going to use your closet? The first thing to figure out is what you are going to use your closet for. 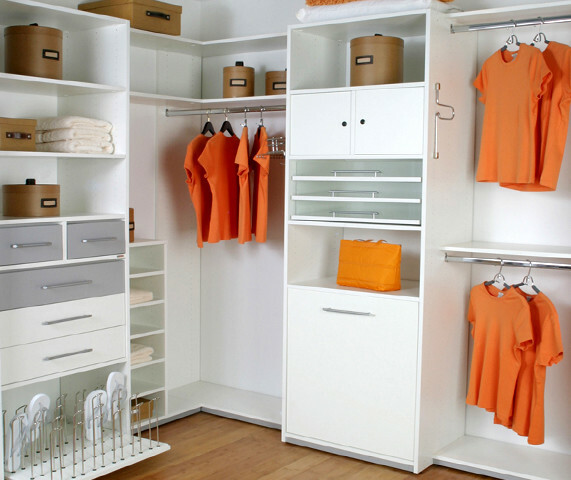 If you are going to use it for storing clothes, see which types of clothes you have. Will they be better folded up or hung on hangers? This will help you determine what sort of storage items you will need in your closet, clothing racks, shelves, and drawer space to name a few. The other thing to think about is whether you will store your accessories in your closet. Think about how easy it will be to store items such as socks, shoes, handbags, ties and other accessories. Smaller drawers or pullout shelves may be a possible solution to help you store your accessories. If you plan to primarily store clothes and accessories for your custom closet space, take note of the size of the space you will be working with, as well as storage spaces and what it is you wish to store in your closet. Making the perfect closet. There are so many different types of do-it-yourself closet systems that will aid in helping you with your custom closet. It is mainly a matter of what sorts of pieces you want in your closet, as well as how much you can afford. After assessing what you will need, you will have many options available to you From shoe racks, to drawers and shelves. Decide which options will suit you best and mix and match. Adding features to an existing closet Maybe you already have a decent closet to work with but simply just want more storage space or a better form of organization. Adding extra shelving on the top of your closet or down either side will give you extra room in order to store more clothes and accessories. Adding shelving on the bottom of your closet will give you room for shoe storage. You can also add another clothing rack below the current one halfway between your current rack and the floor. Hang your pant on the lower rack and your shorter garments such as blouses and shirts right above it. Make sure the clothing rack doesn't extend all the way across, as you want your coats and other longer garments to hang freely without any obstructions. If you are one for a cleaner bedroom, possibly eliminating your dresser and adding drawers onto the doors of your closet may be an option for you. You can store smaller clothing items such as under garments, and socks, as well as making your bedroom look more roomy since there will be no need for extra dressers taking up space.